It’s seven days to go and it’s Valentine’s Day again. Valentine’s Day brings rich memories to me – the day I announced to my friends in church my relationship with my girlfriend, Jennie, who is now my wife. It was twelve years ago (this Valentine’s day), February 14, 2008 and I remember so well, we attended a concert of Ron Kenoly and we were with our peers in church. Since then, I have always tried my best to make Valentine’s Day exciting for my wife by always coming up with surprises. Of course, there have been times when I have not been successful, but most of the time, my wife liked what I did for her. A tip for husbands out there - plan your Valentine’s Day. Be intentional. 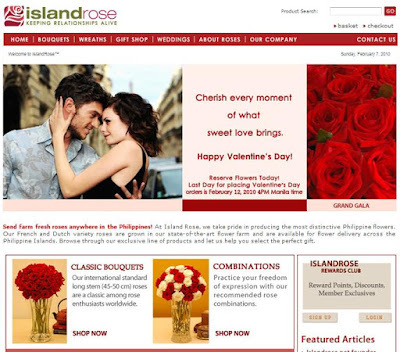 As for the gifts, you can make it exciting by sending her a surprise gift from Island Rose. This web site can Deliver flowers to the Philippines so, now, the husband who is working abroad have less excuses to not send anything for his wife. He can send something as simple but as sweet as Philippine Flowers or as extravagant as a love pendant. Interested buyers for Valentines Day can use this 10% discount code VDAY022010. This discount code is valid until February 20. These simple gestures can make your marriage stronger. Remember, a happy wife makes a happy life! You betcha, I'm one happy wife. You make me! ;-) Love you, baby!